The state agency responsible for helping the public access government-controlled information and ensure public meetings remain as open as possible has been mired in a backlog so big its rulings are often irrelevant by the time they’re issued. Yet relief appears nowhere in sight for the Hawaii Office of Information Practices as Gov. David Ige’s term begins and the Legislature gets set to work on his proposed biennium budget, which despite a modest increase only gives the agency half the resources it had 20 years ago. Meanwhile, the public, nonprofits, government agencies, lawyers and media outlets who regularly turn to OIP for assistance must still wait as long as four years for an OIP opinion or go through a complicated, costly and congested court system for help. The Hawaii Office of Information Practices is forced to do a lot with a little as state leaders add responsibilities while cutting resources. Gov. David Ige is expected to decide later this month what he thinks the Legislature should do next session with the office’s budget. OIP started off strong in the early 1990s under Gov. John Waihee’s administration. Its timely opinions shaped policy debates and strove to improve the public’s overall access to government, whether it was the release of employee misconduct files or the disclosure of police records. But the ensuing combination of legislative actions and leadership decisions — beginning with Gov. Ben Cayetano and continuing with Govs. Linda Lingle and Neil Abercrombie — have rendered the agency almost impotent. OIP’s responsibilities doubled and its budget was halved during Cayetano’s first term. The agency never recovered from that initial gutting despite pleas from good-government groups and political assurances on the campaign trail. “Every governor comes into office praising openness but leaves condemning it,” Hugh Jones, an OIP attorney during the agency’s formative years, told Civil Beat on Monday. In his campaign for governor last year, Ige promised greater transparency, accountability and accessibility — something OIP could help provide with the right resources and direction. Ige, who just took office Dec. 1, hasn’t decided yet what he wants to do with OIP’s budget. Laurel Johnston, Ige’s deputy chief of staff, told Civil Beat on Monday that the relatively flat budget proposal for the next two years was an approach the prior administration adopted across all departments. The governor will be looking at requests from all departments and recommending budget adjustments to the Legislature by the end of the month, she said. One thing is for sure though. OIP can’t conceivably keep pace with its growing workload and limited resources. That means the public will likely face continued frustrations due to delays in getting help prying information from reluctant government agencies — an issue Civil Beat most recently reported about in December. In that example, The Garden Island newspaper had sought OIP’s help in forcing Kauai County to release the toxicology reports of two teens who died in fatal crashes. The initial request to the office was made in 2010; OIP didn’t issue its ruling until 2014. 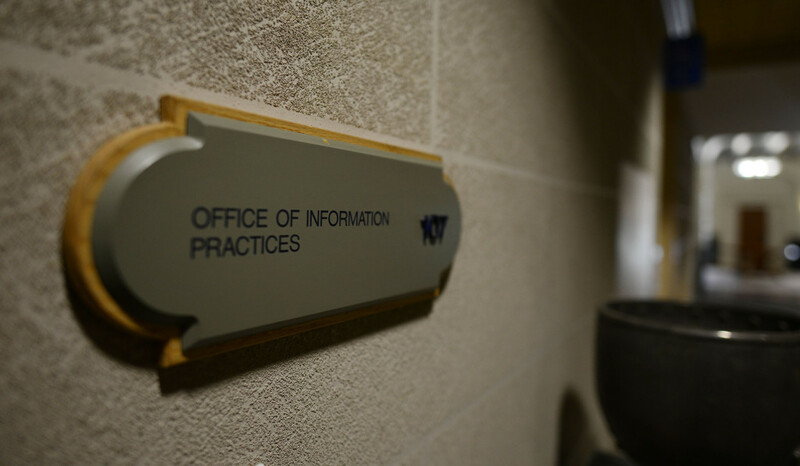 Last year, OIP managed to reduce its backlog of cases despite a 15 percent increase in the number filed, according to the office’s annual report to the Legislature. There were still 104 cases pending at the end of fiscal 2014, which ended June 30. Jones said there’s always been a backlog, even when the agency was only responsible for administering the Uniform Information Practices Act, Hawaii’s open-records law. In 1998, the Legislature added the Sunshine Law to its list of duties, effectively giving the office twice as much work. The GMO issue and rail transit alone in recent years provide a plethora of new reasons for people to ask OIP for help accessing information, he said. 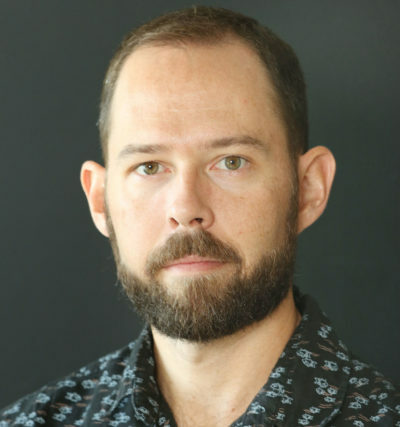 “If that fire hose goes through a garden hose at OIP, you’re going to have a backlog,” said Jones, who left OIP to work for the state Attorney General’s office and lecture at the University of Hawaii’s law school. OIP was created to be an agency the public can turn to, free of charge, for fast public assistance. “That hasn’t turned out to be the case, but it’s a resource issue,” Jones said. In all, OIP had 8.5 full-time equivalent positions last year, including 3.5 full-time equivalent staff attorneys and one open-data attorney. OIP received just under $540,000 in 2014, including a $100,000 infusion to hire the open-data attorney and money for collective bargaining increases. That’s up from 2013 when the agency received just $391,000. Ige’s proposed budget for 2016 is $562,683, which would preserve the open-data attorney position the office has said it needs to keep. His proposed budget for 2017 is $575,984. 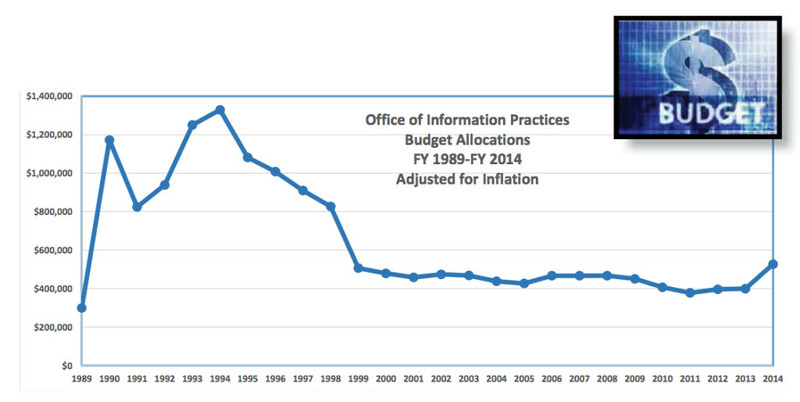 OIP’s budget peaked in the early 1990s under Waihee. In 1994, OIP’s budget, when adjusted for inflation, was $1.33 million with 15 approved positions. The Legislature and subsequent governors slashed the office’s budget and have kept it at roughly half its highest level. The Legislature, which starts its next session Jan. 21, is expected to decide by late April how much money to give OIP for the coming biennium. Sen. Les Ihara, who serves on the Ways and Means Committee, said there’s no doubt OIP is understaffed and its budget should be increased. But he said it’s hard to get sufficient support in the Legislature. Ige, who chaired the Ways and Means Committee before he became governor, faces a fiscal future of limited additional spending, making the choices more about priorities. Over the next few years, the state plans to spend more than it takes in, relying on an $844 million carryover balance from Abercrombie’s last year in office to make ends meet. OIP’s annual report, submitted to the Legislature in December, explains a new plan to reduce its backlog. Instead of a general first-in, first-out policy, OIP will be looking at who is filing the cases. “Of the formal cases, a disproportionately large number have been filed in recent years by a small group of persons: in FY 2014, 36% (73) of the formal requests came from one individual (10 cases), one couple (19 cases), and a group of inmates (44 cases),” OIP wrote in its report. The office says it would have had only 30 formal cases pending at the end of 2014 without the cases filed by these repeat requesters and some that are in litigation in courts. OIP has reduced the age of pending cases by eight years. “To address the current backlog of cases in a manner that is fair to all requesters, OIP’s priority for FY 2015 is to resolve the 30 pending cases not tied to litigation or filed by the top three requester groups and to resolve the remaining cases as OIP’s resources permit,” the report says. In all, OIP resolved 37 percent more formal cases in 2014 — 195 — than it did in 2013. The office’s annual report notes that OIP has succeeded in addressing the oldest cases. In 2011, the oldest case resolved was 12 years old; OIP’s two oldest cases resolved in 2014 were four years old. OIP only issued two formal opinions in 2014, one on public records and the other on public meetings. In the UIPA case, OIP was asked whether Honolulu’s Department of Planning and Permitting had to disclose a legal opinion from city attorneys about the permitted uses of the Waikele Caves. OIP decided it wasn’t subject to mandatory disclosure. In the other case, OIP was asked whether the Board of Land and Natural Resources violated the Sunshine Law by not including in its minutes the views expressed in written testimony that had been submitted to the board about an agenda item for its meeting on July 27, 2012. OIP found the law had no express requirement that the board’s minutes should reflect views presented in written testimony.